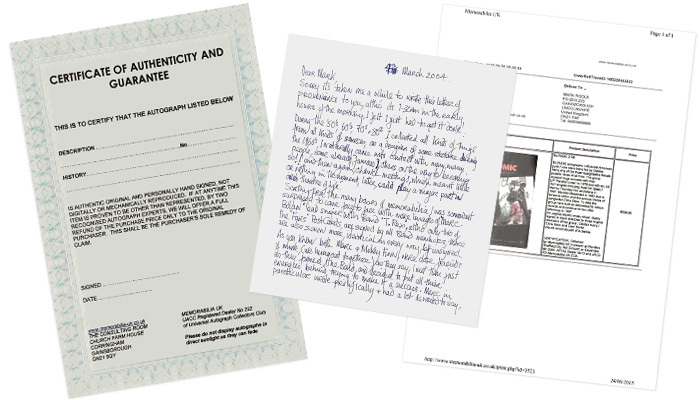 With each autograph the purchaser will receive their own unique personal handwritten and numbered certificate as shown. Then full details on an additional page of the known history with thumbnail photograph of the item itself and in many cases a letter from the original obtainer detailing his / her memories. Customer - please read the full description of the item. We try to accurately describe each product, in most cases giving size / type / condition and a biography. The Certification importantly will inform you of any know history / signing details / if any additional written provenance is included and who the COA is being issued by. We are one of only a handful of dealers who are either able or bother to go to such lengths to ensure customer satisfaction. This is because we source 95% of our items only from the original obtainer. Most dealers simply buy in autographs and do not research origin and history. Our method is very time consuming but allows us to sell autographs with a clear consciense and in the full knowledge that we have done everything possible to alleviate risk. We believe that the customer has every right; indeed should ask questions about items rather than just accepting being fobbed of with a Certificate of Authenticity. Read about this in my Advice section. 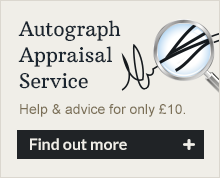 * You will receive a handwritten A4 sized personal numbered certificate; that matches a number on the item itself. Certificate is handwritten to avoid the certificate itself being copied. * You will receive a separate page from the website itself detailing know history; with a thumbnail of the item itself. * In many cases wherever possible you will receive a letter written by the original obtainer of the autograph; for additional provenance. * We will have researched and checked that all known details / history correspond. * Certificates (COAs) are one of the most misunderstood and abused areas in the autograph world: 95% of certificates issued are probably worthless from unregulated dealers and sellers. We will endeavour to answer all your COA questions in order for you to understand scams in our advice forum.